There are good dog houses, and then there are great dog houses … I’d like to think that the “Barker Table” doghouse falls into the latter category. If you swing through Life of an Architect with any regularity, you know that I think it’s really important for architects to use their skills to benefit the greater good. There are innumerable ways that we can take advantage of our skill set and contacts to help others, and one of my favorites is to design playhouses and dog houses for charity. This is the “Barker Table” an interior doghouse that is being donated by Malone Maxwell Borson Architects, along with JRT Construction, to the Bark + Build event benefitting the SPCA (Society for the Prevention of Cruelty to Animals) of Texas. The Second Annual Bark + Build Design/Build contest and raffle benefiting the SPCA of Texas’ 26th Home for the Holidays Event will take place November 14 through December 4 at NorthPark Center. It’s all to help the SPCA of Texas rescue, heal and find homes for tens of thousands of North Texas animals in 2016. Because the SPCA of Texas relies on private donations, events like Bark + Build Home for the Holidays are absolutely essential to making our community a better place for people and pets. All entries will be judged on both design and construction quality by jury panel, with various award categories, and then displayed to the public at NorthPark Center from November 14 through December 4. While on public display, raffle tickets will be available for purchase with all proceeds benefiting SPCA of Texas. SPCA of Texas mission is to provide every animal exceptional care and a loving home and is the leading animal welfare agency in North Texas. This competition serves to foster relationships between architecture and contractor firms and raise awareness and support for SPCA of Texas’ mission while exhibiting to the public the high-quality design and construction value and talent of the participating professional teams. This is the second year of this event, and this is our second entry. While we are participating because it’s the right thing to do (and we like to say “yes” to this sorts of events) we take these events seriously but try to have fun with them. Our office is 50% men and 50% women – last year’s doghouse was designed by the women in our office so it was only fair that this year’s doghouse be designed by the men. I’m a little surprised that I have a picture of the jury process, but it doesn’t even come close to showing all the people involved. We held the jury at the contractor’s offices and had everyone in the office tape their designs up on the wall. We had them present their designs to a jury of eight people (two contractors, a veterinarian, and five architects) and we voted on which idea we thought was the most worthy of further development and ultimately construction. In the end, it was the ‘Barker Table’ from associate Ryan Thomason that was selected. The concept for this doghouse is really simple – design an enclosure that looks like it deserves to be in your living room. 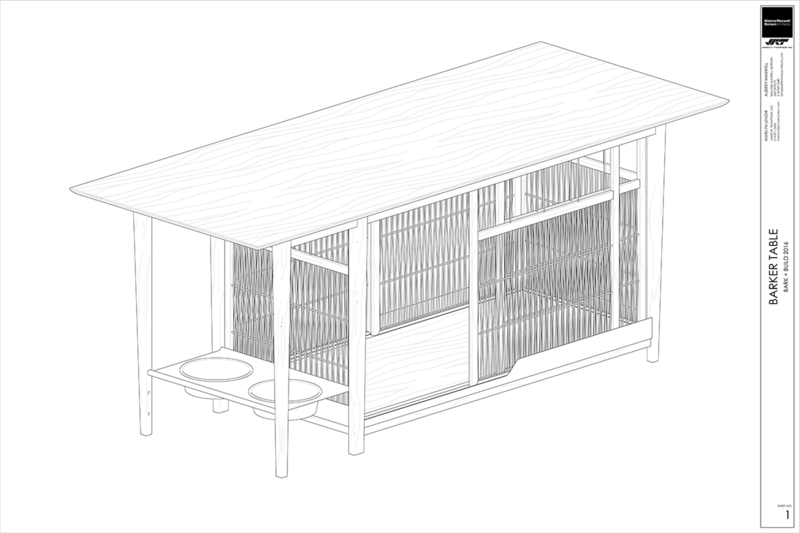 Since Ryan lives in an apartment, he wanted to design a doghouse that would suit his personal situation … that any doghouse in his home would be front and center in his home. 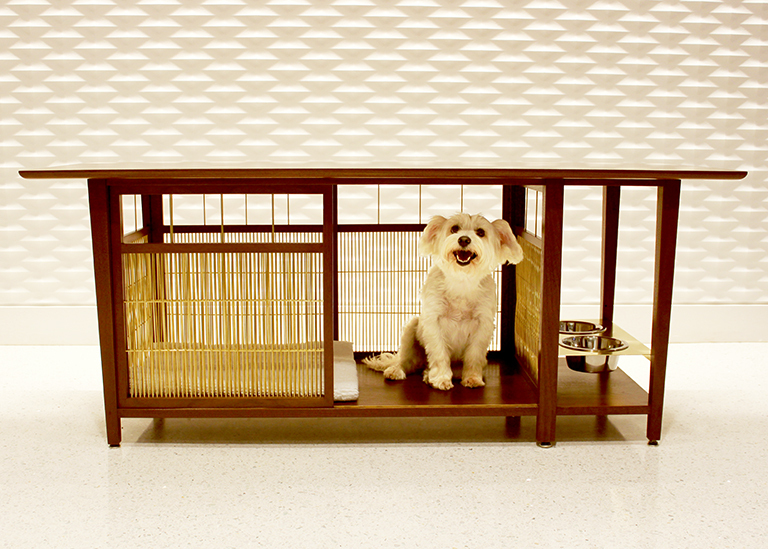 As a result, these parameters fundamentally drove almost every design decision that was made, from the wood species used (walnut), to the incorporation of the feeding and water bowls (his kitchen is open to his living room) and to the size of the doghouse itself (it is the same height as an end table). Basically, Ryan wanted a doghouse that looked primarily like a piece of furniture but would function as an interior doghouse. Normally I am not the biggest fan of brass, but I have to admit that it looks really amazing on this doghouse. There is a feeding station for food and water incorporated into the end of the table with a demountable brass tray that allows for easy cleaning. There is a shelf set just below the bowls that was added during the course of construction to provide additional stability – while purely functional, it turned out to provide a nice visual balance to this end. This doghouse turned out wonderfully and the quality of the craftsmanship from the contractor really pulled everything together. There was internal concern that we weren’t building a doghouse but a piece of furniture that functions as a doghouse. This required a considerable amount of scrutiny on the joinery and detailing … and required that JRT Construction really pay attention to the finer construction details. 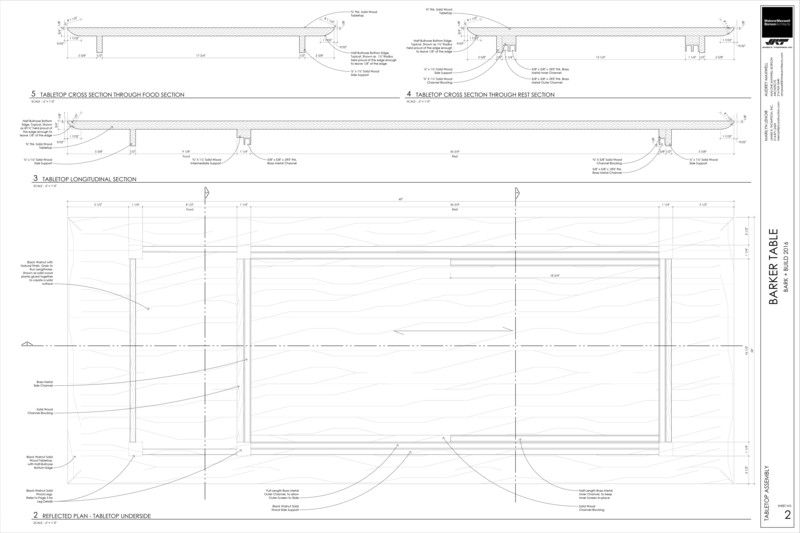 Just like all my playhouse designs, I am going to share the construction drawings for this doghouse. These drawings were put together by Ryan and he took some liberties to explore some changes to our typical drafting standards. I don’t believe that Ryan (like so many of you) doesn’t care much for the architectural chisel fonts that I typically require, so he changed them out for something more to his liking. You’ll have to let me know what you think. 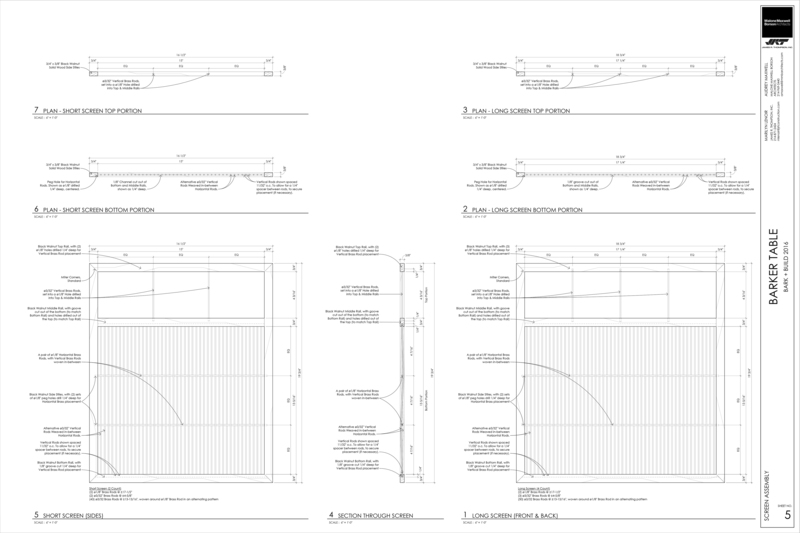 These construction drawings, like all of our construction drawings, were prepared using Revit. 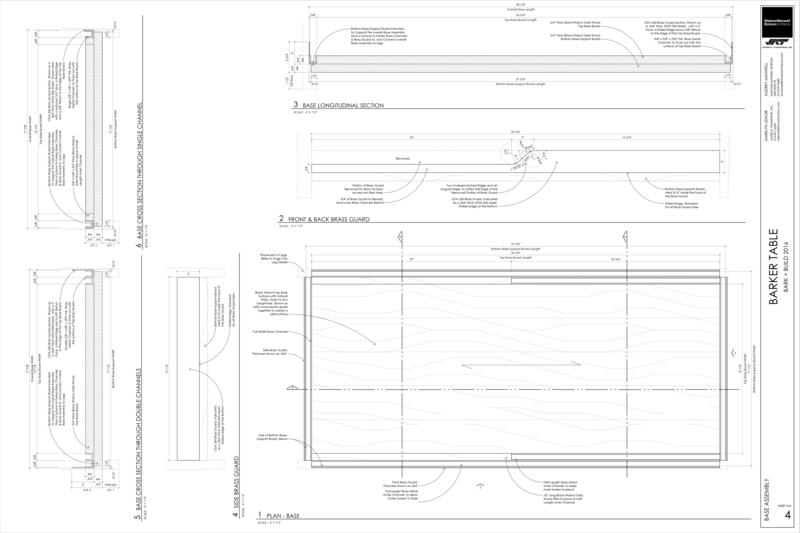 Since we don’t typically design furniture, the construction detailing really focused on trying to explain the end product rather than provide a step-by-step guide on how to build everything. 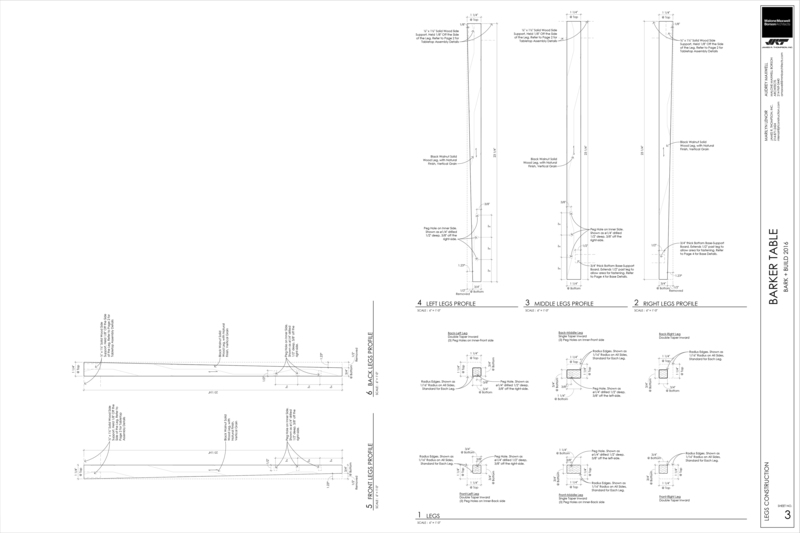 Dimension control was a big part of that communication but before I hear about it in the comment section, I am aware that dimensioning to 1/64th of an inch is a bit excessive. A lot of attention goes into creating a design such as this. Fundamentally the design is incredibly simple but like most things, simple is incredibly difficult to achieve and places much more focus on the execution of the built product. IF you haven’t already figured it out, all of these drawings can be selected and will open up in a much larger window and you can scrutinize the construction details for your heart’s content. I’m going to have to tell Ryan that he has to follow-up on any technical questions in the comments – my only contribution to this design was at an extremely high level … the “Why are you doing that?” and “Did you think about this?” variety of contribution. I am very happy that my firm views these charitable causes as worthwhile activities and that we find ways to support participation. Ryan and the rest of the design team put a lot of work into this doghouse and I know that some lucky winner is going to be incredibly happy when their raffle ticket is selected. Who knows, maybe that someone could be you? Cheers – and get involved. Everyone benefits.